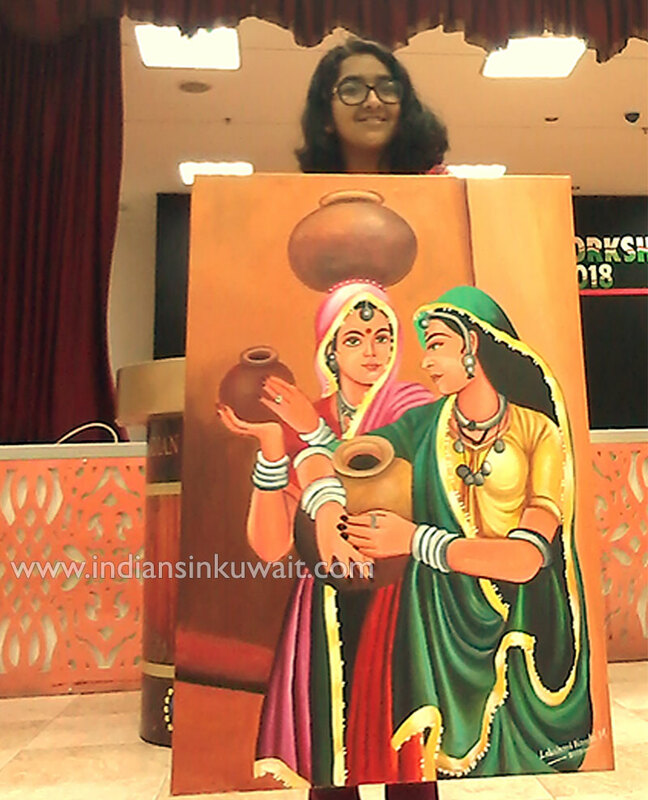 Indian Educational School, Kuwait held a 7 day Winter Camp- Acrylic workshop for bhavanites to engage themselves in the mesmerizing experiments with Acrylic paint on canvas from 23rd December 2018 to 3rd January 2019. As an amateur artist myself, I enrolled for the camp. 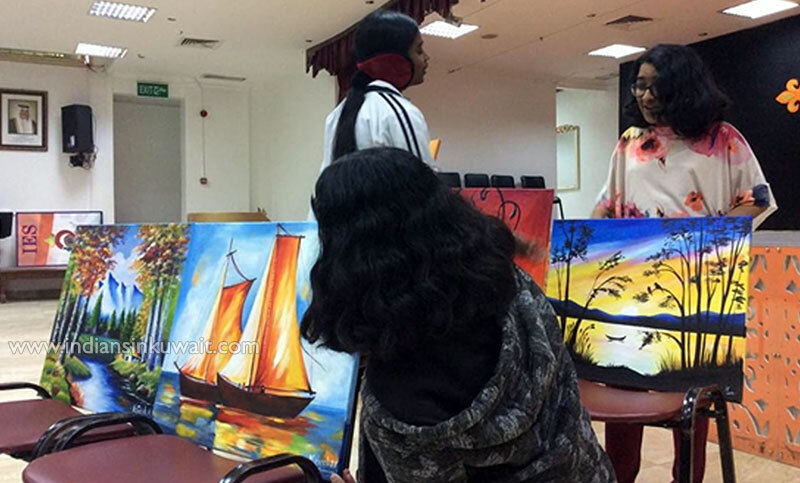 Including me there were other 4 artists who joined the camp, Najidah Abdul Nayaf, Mereeba Elizabeth James, Joshua James Joseph, Jiya George Varghese and the workshop was headed by Mr. Mukundhan Pazhanimala, HOD of Art Department, Bhavans Kuwait. It was a great opportunity and we learned a lot under the guidance of Mukundhan Sir. The camp has taught me different things other than how to paint with acrylic. When I started with the painting, I thought I would not achieve good results. Because even though I had painted a lot of acrylic paintings, this was different as it was the first time I was doing a human figure in a large canvas. I thought it was really complicated and it would be difficult but Mukundhan Sir helped and gave me few tricks for making the painting good and I believe the painting turned out attractive. It is said that small changes end up huge results. That is the same way in art. If you just apply the paint without small highlights or shades, it may not come as good as you expected. Adding small details or focusing on them will make the painting more natural and vibrant. It will also enable the artist to excel his/her painting skills. Every problem has a solution, although it may not be the outcome that was originally hoped for or expected. When painting, I have come across situations where either I make a silly mistake or I don’t get the colour mix right or the texture was wrong. Do you know that this is the best part in painting? As every problem has a solution, even though I got things mugged up, Sir would say how to fix it and its much more fun to correct the mistakes. Art is a package of fun and creativity and I could experience this to the fullest. While painting we would have funny moments like someone ends up making mistakes and that person just says jokes about it etc. Sir used to play flute music in old Malayalam songs from the internet while painting and he used to ask us to guess the song. On the last day, when arranging the paintings were the funniest part, we were just mocking each other even though that is rude it was enjoyable. “Art is something that makes you breathe with a different kind of happiness." -Anni Albers. According to me art is a mediocre between what we feel and what we know. Art increases our creativity and makes us enthusiastic. So go paint on a canvas and find your jolly self.